You’re on page 1 of Football Quotes – 11 pages. 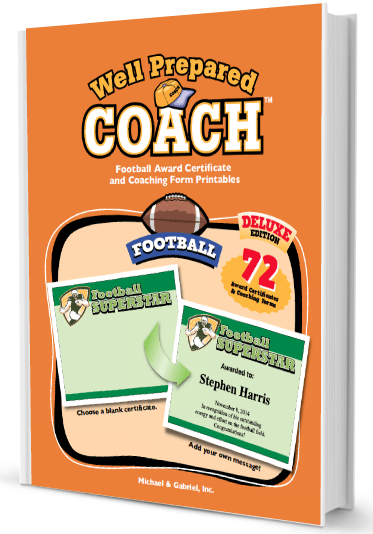 A hard-hitting collection of awesome, inspirational football quotes in a quick-glance, alphabetic format. 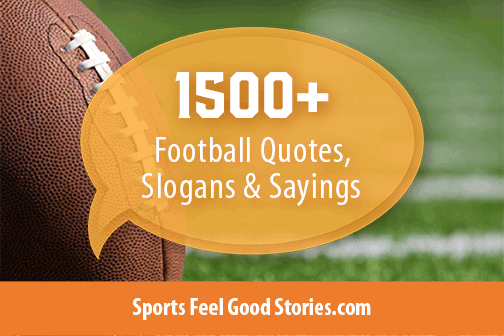 Motivate your players, inspire fans or simply amuse yourself with these funny and motivational quotations. Have you loved football your whole life? These are for you. Page 1: A collection of funny football sayings featuring some big names like Tom Brady, Drew Brees, Adrian Peterson, Colin Kaepernick and others. See below. 3: Motivational sayings from college coaches including a big section of Bear Bryant. 4: More college football from coaches – Lou Holtz, Joe Paterno, Pete Carroll, etc. Page 5: More of the best from retired NFL stars (Last names A thru M) – Terry Bradshaw, Jim Brown, Earl Campbell and more. 6: Retired NFL stars (Last names: N thru Z) – Joe Namath, Bronco Nagurski, Walter Payton and more. Page 10: John McKay – always funny! I feel like we can run the table. This wasn’t just a shot in the dark – It was an optimistic belief in my teammates. A football coach is a person who is willing to lay down your life for the good of his team. Playing football in the morning is like eating cabbage for breakfast. Sometimes, getting up in the morning and brishing your teath is the hardest part of the day — it all just hurts. You have to play this game like somebody just hit your mother with a two-by-four. The Rose Bowl is the only bowl I’ve ever seen that I didn’t have to clean. I play a complicated position in an intensely team-oriented game. You don’t like to see your guys take the field without you because it makes you feel like, man, maybe they really don’t need me out there, which is kind of humbling. In Boston, they love their sports celebrities. And it’s great! I don’t think there’s a lot of carry-over from year to year. I don’t think anybody cares what you did the year before. I’m an emotional person. Sometimes I can’t help it. With football, you can have up to 28 guys you consider starters, and if they can pick up the slack when some aren’t playing so well, you don’t have to turn those two-game losing streaks into six-game losing streaks. Check out hundreds of slogan options for your squad. Click on visual above. If you’re a quarterback, you want everything on your shoulders. You want to be the one to make the decisions. I’m much more comfortable and confident running out on the field in front of 70,000 people instead of standing in front of a camera trying to say some lines. When you hang with a bunch of 300-pound linemen, you tend to find the places that are the greasiest and serve the most food. I don’t care about three years ago – I don’t care about two years ago. I don’t care about last year. The only thing I care about is this week. We’ve got something special going here. We want to keep it going. You don’t have many opportunities like this, and the window of opportunity for us is now. I expect to win out there. There’s always a little bit of personal satisfaction when you prove someone wrong. I don’t know about voodoo, but I believe in destiny. I hope our hopes and aspirations are bigger than setting records. We all understand what we signed up for, but then again, you don’t want this to be a game that puts people in wheelchairs at age 40. The only team that believed in me was the Saints, and I feel like I owe them a great debt of gratitude. I want to give them what they saw in me—a guy who could lead this team to a championship. We always try to mix it up—three-step drop, five-step drop, seven-step drop, naked bootleg. We spread out all these kinds of things to keep the defensive pass rush unbalanced. I was brought here [New Orleans] for a reason. I feel like I can make a tremendous impact, not only with the team but in the community. I’m just feeling like it was meant to be. What can I say? The birth of my son, and in the first year of his life, we won a Super Bowl Championship. 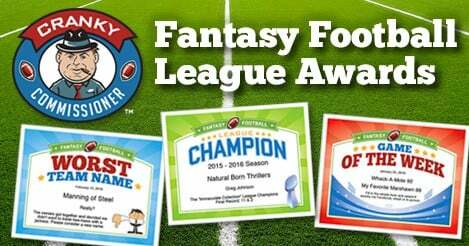 A boatload of funny options for your fantasy football team. Please click on visual above. We just believed in ourselves, and we knew that we had an entire city and maybe an enitre country behind us. What can I say? I tried to imagine what this moment would be like for a long time, and it’s better than expected. The Super Bowl is a realistic goal. It’s my job to get us in good plays, or more importantly, out of bad plays. I don’t believe that you can be too short as a quarterback. It’s not about height. When you care about a guy beyond just the field, that’s when the chemistry becomes really special. I expect to make big plays. And when I don’t, I’m upset about it. Four years ago, who ever thought this would have happened? We had some sickly youngsters last week. We’ve got to build some immune systems — more pushups, more whole milk. You know, that’s what good quarterbacks do, they make plays when things don’t go perfectly, which a lot of times they don’t, and Tom does a good job of that. There’s no substitute for guts. Don’t give up at half-time. Concentrate on winning the second half. Three rules for coaching: 1.) Surround yourself with people who can’t live without football. 2.) Recognize winners. They come in all forms. 3.) Have a plan for everything. Football is not a contact sport. It’s a collision sport. Dancing is a good example of a contact sport. I’ve always tried to coach people the way I would like to be coached; positively and encouragingly rather than with criticism and fear . . .. I’ve tried to be as fair as possible. Looking for inspiration soccer fans? Check out our soccer quotations. I consider adversity being good sometimes, you know. You’re never guaranteed about next year. People ask what you think of next season, you have to seize the opportunities when they’re in front of you. Every game I’ve ever played, regardless if it was pre-season or Super Bowl, meant the same to me, and I laid it all on the line. I know it’s not a one man team win or lose. There wasn’t a better teacher or mentor out there than Reggie White, on or off the field. Maybe I’m old-school, but I always thought you honor a contract. Life deals you a lot of lessons, some people learn from it, some people don’t. I’ve always been a Packer, always will be a Packer. In football, like in life, you must learn to play within the rules of the game. Welcome to the Salvation Army. I’ve never been associated with an offense so nice about giving the ball away. We’ll take what the other team gives us. We’ll scratch where it itches. If you’re mad at your kid, you can either raise him to be a nose tackle or send him out to play on the freeway. It’s about the same. 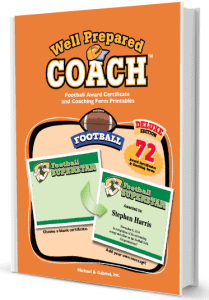 A good football coach needs a patient wife, a loyal dog and a great quarterback – but not necessarily in that order. Let’s face it, you have to have a slightly recessive gene that has a little something to do with the brain to go out on the football field and beat your head against other human beings on a daily basis. 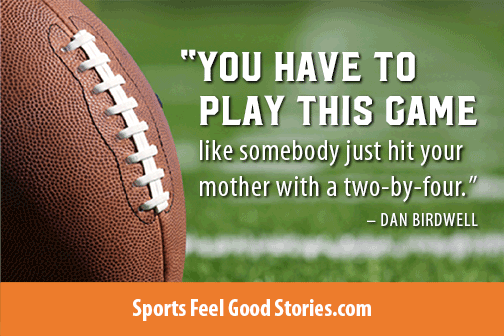 Tip: These quotations make great content for high school football posters and locker room signs. I try to go through my reads and then, if I have the option to run, I do run. “There’s a fine line between playing with fear and then taking bad plays and playing with no fear. I think I’ve proven that I’m throw-first, and then run if I need to. The only reason you get drafted or even looked at by the NFL is because they believe you can play at the next level … if they believe I can do that, you know I believe I can do it. A lot of people have already labeled me the Savior. Last time I checked I was able to throw the ball a little bit. No one coaches what to do after three seconds, after the quarterback’s broken the pocket or he’s been in the pocket for five, six seconds. The speed will increase and the players will be better, but also the players around you will be a lot better. It all cancels itself out. I’m always studying. I probably wrote the most papers of any college quarterback. I’d love to play basketball with the president, or throw the football around or something like that. The Redskins haven’t won the division since 1999, and we came in and we did it in one year! I still don’t think it’s sunk in that I won the Heisman. I’ll be able to reflect back on the season, appreciate those types of things and realize that although I wanted to ‘be like Mike’ when I was growing up, now I get to go out and be in the NFL. The mold that everyone is seeing nowadays is kind of the Aaron Rodgers mold – I try to mix and match from the different quarterbacks. Nothing is work unless you’d rather be doing something else. If you live long enough, lots of nice things happen. Many people flounder about in life because they do not have a purpose, an objective toward which to work. Don’t do anything in practice that you wouldn’t do in the game. Find out what other teams want to do. Then take it away from them. I can’t believe that God put us on this earth to be ordinary. Don’t be a spectator. Don’t let life pass you by. On this team, we’re all united in a common goal: to keep my job. 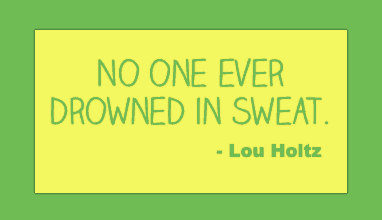 If what you did yesterday seems big, you haven’t done anything today. They say a tie is like kissing your sister. I guess that is better than kissing your brother. I asked you to pack your headgear and shoulder pads, but more importantly your defense and your kicking game, because that’s what wins game like this. It’s not the load that breaks you down – it’s the way you carry it. If you burn your neighbor’s house down, it doesn’t make yours look any better. You’ll never get ahead of anyone as long as you try to get even with him. Don’t tell your problems to people: eighty percent don’t care; and the other twenty percent are glad you have them. It’s a better view if you’re standing up than if you’re laying down. The goal every year is to win the Super Bowl, not just to get to the playoffs, not just to win a few games. During the season, I dodge the media. After practice, I need to be taking care of my body and recovering. You didn’t want to bring home anything but an A or a B. To my mom, a C was like an F.
You can’t get down and think things won’t get better or they definitely won’t. Hopefully I can finish my degree before I get done playing and work with my foundation. I like to run the slants. The slants are cool. I like routes that you can catch the ball running. I’m not going to lie and say that I’m good at Madden. There are some good players out there. There are some good players on the team. I get skunked all of the time. I just want to improve game to game and try to get better. Going out on the field frantic isn’t going to help you score points. You have to try to lead your team. Something you’re aware of being a quarterback coming here—you have expectations, and you want to live up to those. I have to learn more in order to preserve my body. It is really like a family. We are around each other more than we are around anybody else. The time we spend together, and the hard work we put in together, it is going to build a close team. You’re always going to be mad about a bad play. God has brought me this far. He has laid out a phenomenal path for me. And I can’t do anything but thank him. Score a touchdown, kiss your tattoo. Kaepernicking! There are a lot of other parts on this team that do great things to make it easy for me to go out there. Being an NFL quarterback there’s a lot of advantages that come with it. There are a lot of doors that open when you’re a quarterback but at the same time there’s a lot of scrutiny. There are a lot of things you can’t do as well. Right after the game, say as little as possible. There are several differences between a football game and a revolution. For one thing, a football game usually lasts longer and the participants wear uniforms. Also, there are usually more casualties in a football game. The object of the game is to move a ball past the other team’s goal line. This counts as six points. No points are given for lacerations, contusions, or abrasions, but then no points are deducted, either. Kicking is very important in football. In fact, some of the more enthusiastic players even kick the ball, occasionally. Peyton was the best, my favorite quarterback growing up. My dad hasn’t said much about his college days. Oh, a few times, he might start telling stories. And I’ve seen some highlight film of him from college. I remember thinking he looked really small. Which is funny, because growing up, I thought he was a pretty big guy. No one prepares to lose … we prepare to win. I realize that as the quarterback, you have to assume some sort of leadership role because you have to talk in the huddle on every play, and you’re essentially giving out orders to the team. But in my mind, I have to prove myself on the field before I can start asserting a leadership role. The victories are what I judge things on. I think the preseason helps a lot, just to feel a little bit about the speed of the game. I’ve been lucky enough to be around some great coaches, all the way from Pop Warner to now. Hopefully one day I can be up there with Peyton in terms of history. It’s fun to learn a new playbook. Football is not a game but a religion, a metaphysical island of fundamental truth in a highly verbalized, disguised society, a throwback of 30,000 generations of anthropological time. You’ve got a goal in life. I’ve got a goal. Now all we need is a football team. Baseball is what we were. Football is what we have become. If “ifs” and “buts” were candy and nuts, what a Merry Christmas we’d have. We’ll fight ’em until hell freezes over, then we’ll fight ’em on the ice. When it comes to football, God is prejudiced – toward big, fast kids. There’s no thrill like throwing a touchdown pass. Cause there’s only one reason for doing anything that you set out to do. if you don’t want to be the best, then there’s no reason going out and trying to accomplish anything. You learn you can do your best even when its hard, even when you’re tired and maybe hurting a little bit. It feels good to show some courage. He was the only man I ever saw who ran his own interference. I like linebackers. I collect ’em. You can’t have too many good ones. You have to perform at a consistently higher level than others. Thats the mark of a true professional. When I go out on the field, I just put it in my mind that I’m playing for my family. I definitely run up right, and I’ve got pretty good speed. I’ve been running like this since I was seven. I’m pretty sure I could outrun the whole Dallas Cowboys team. My dad means a lot to me. He’s the one who put a football in my hands. People say I’m injury-prone but that’s definitely not true. I run angry. Football allows me to take out some of my pain on the field. It feels good to give back to the people who support you. I have to continue to be a great leader and contribute in any way that I can, and get guys to follow suit. That’s how you turn a team around. I’m really not vocal and expressive, but I’m starting to get more comfortable to open up. I have the mentality that if you come in playing not to get hurt, that’s when you’re going to get hurt. So I play relentless. I want to win four or five championship rings. That’s how I dream. I dream big. I want to be the best player to ever play this game. Most football players are temperamental. That’s 90 percent temper and 10 percent mental. At the base of it was the urge, if you wanted to play football, to knock someone down, that was what the sport was all about, the will to win closely linked with contact. I resigned as the Broncos head coach because of illness and fatigue. The fans were sick and tired of me. I’m excited about the opportunity to get out there and show not only what I can do but, more importantly, what this team can do with me in there. I don’t like to sit still. I’m out there having as good a time as I did in the backyard since I was five-years-old. You want to be playing your best in December and hopefully it’ll carry over into January. It’s time for me to step up and take control. That’s what I’ve always been used to. Anybody who has watched me play knows I’m not one of the fastest guys, but I understand what’s going on around me and what to look for. I know what the defense is doing. I’ve been calling plays in the huddle since I was seven. I’ve already developed trust in my teammates – as a player and as a person. I’m getting better every day. I found that prayers work best when you have big players. Build up your weaknesses until they become strong points. One loss is good for the soul. Too many losses is not good for the coach. We count on winning. And if we lose, don’t beef. And the best way to prevent beefing is – don’t lose. It isn’t necessary to see a good tackle. You can hear it. There is no need for me continuing unless I’m able to improve. Win one for the Gipper. On the road we’re somebody else’s guests – and we play in a way that they’re not going to forget we visited them. A coach’s greatest asset is his sense of responsibility – the reliance placed on him by his players. I must hide my emotions pretty well, because I get fired up before the games. I get anxious every week. It doesn’t change. Anytime you turn the football over in this league, it’s tough to come back and win the football game. Away from football, I’m happiest just spending time with my family and friends. They’re some of the few people who don’t ask you about football all the time, and that’s nice. You can’t worry about all the long-term stuff. You just have to go out there and have confidence in yourself. As a quarterback, you’ve got to protect the football. I’ve always been of the belief that if you prepare well, you can go out there and play your game. You find a balance between preparing for football and finding time to rest and take care of the things you need to lead a normal life. Quarterbacks make their living on third down and in the red zone. When you get out there and you start playing the game, you know you’ve put in a great week of preparation. That allows you to just go out there and play. Community is something that’s been important to me. It was important to me while I was at Boston College. One of the great things about being a Falcon is the player-development department. They do such a great job of helping with the transition. The first time you run out on that field and realize it’s for real. Whether you win or lose, it’s just a ton of fun. After the season, you need to remember to pace yourself before you get to training camp and the regular season. The guys around me are playing really well and when you have that, it kind of makes a quarterback look better. I want to be around here a long time, with this team, go to the playoffs and hopefully win a championship. It’s a long season. There are going to be some ups and downs. I think just the opportunity to play, to be out on that field and realize it’s the NFL and you’re playing at the highest level of competition there is, that’s pretty incredible. I learned that if you want to make it bad enough, no matter how bad it is; you can make it. How fast does William Perry run? It all depends on what speed you run the projector! Anyone can support a team that is winning – it takes no courage. But to stand behind a team to defend a team when it is down and really needs you, that takes a lot of courage. If you work harder than somebody else, chances are you’ll beat him though he has more talent than you. There are few secrets in football. So execute. The principle is competing against yourself. It’s about self-improvement, about being better than you were the day before. You cannot win if you cannot run. When you get old, everything is hurting. When I get up in the morning, it sounds like I’m making popcorn. I always thought I could play pro ball. I had confidence in my ability, You have to. If you don’t who will? I remember my dad asking me one time, and it’s something that has always stuck with me: “Why not you Russ?” You know, why not me? Why not me in the Super Bowl? We’ll do whatever it takes to score as many points as we can—and definitely one more point than the opponent. If you can throw a football 80 yards, for some reason people think that’s pretty cool. And if you’re playing New England in the Super Bowl and you’ve got 26 seconds left and you’re down by four and it’s second and goal on their one-yard line, try not to throw an interception. That last one is purely hypothetical, though, of course. Tip: Check out Russell Wilson on Instagram. I don’t think I’ve arrived. I think I’m continuing to get there, getting closer and closer to where I want to go. But I’m not there yet. I miss my dad every single day. People have asked me, if I had five more minutes with him, what would I say to him? But I wouldn’t say anything at all. I would just hug him. That’s what I would do. I know the coaches definitely trust me and my ability to throw the football. Because if you know what you’re capable of, if you’re always prepared, and you keep things in perspective, then life has a way of turning no into yes. Here’s something I really have learned: you can’t do it alone. You’ve got to surround yourself with good people. Because if you’re earning a degree from UW–Madison, the question isn’t whether you have something to offer the world. You definitely have something to offer the world. The question is how and whether you’ll do it. I would say good luck, but I don’t believe in good luck. Go make it happen. The first pitch is a slider, and what do I do with it… swing and miss. Next pitch, a slider again, strike two, I shouldn’t have swung. I’m one strike away from losing the game. But then he throws me a fastball. And what do I do with it? Wham. Hit it over the fence. Now, everyone in the stands that day saw the game-winning home run. But they probably didn’t notice the guy who spent all those innings on the edge of the dugout, with a helmet on his head and a bat in his hand. But if I hadn’t stayed prepared like that, for 10 or 11 innings, that home run – that never would have happened. On signs for lockers and in the locker room. In emails and team communications. At practice or in film sessions. For season-ending banquets or speeches. If you know any more football quotes that you’d like to share, please submit them through our “Contact Us” page.